Slaty Creek Campground Number 2 is the second of three camping/picnic areas along Slaty Creek within the Creswick Regional Park. It features a clearing bordered by logs with a fire pit / barbecue plate at its centre. This small campground is located just around the corner from Slaty Creek Campground Number 1 by road, and a short walk up the hill from it by foot. The toilet block and picnic area of Campground Number 1 (just visible through the trees) are an easy moments walk down the slope, making this a convenient, quiet spot to set up camp. Another basic campsite, Slaty Creek Campground Number 3, is located about five minutes drive from here. Slaty Creek is a great area for bushwalking, birdwatching and gold prospecting. 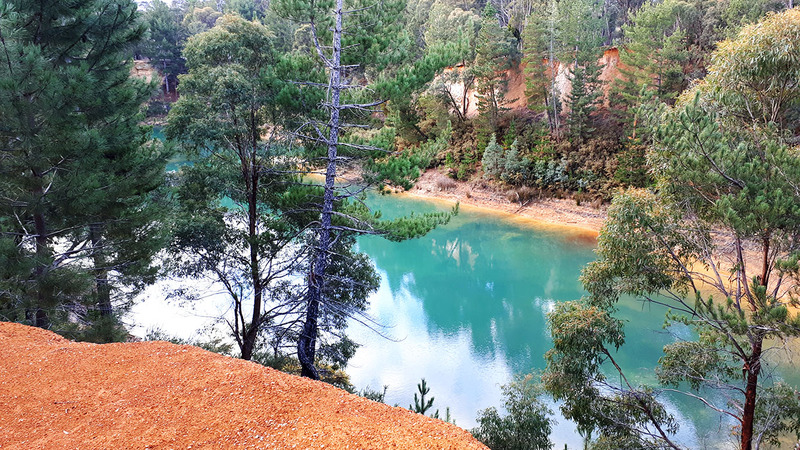 Blue Waters, Creswick Regional Park. Less than 10 minutes from Slaty Creek Campground Number 2.